It’s been a very busy start of the year but also very inspiring. Can you be busy and relaxed at the same time? Two weeks of the Art of Photography course are behind me with two assessments passed successfully, two weeks are in front of me to be fulfilled. It’s obvious that the contents of the course can’t reach very deep in such a short term and within the wide range of topics and it’s true that I already know the basics. Yet there ARE new pieces of information included and I find it enormously interesting to listen to the lessons. Fortunately I don’t have any problem to understand the videos and though I can spot a mistake in the video transcripts here and there, the transcripts are great when I want to write down some notes. Following the videos and quizzes takes more time than I expected but that’s because of the writing of the notes. Sometimes a bit unnecessarily, I admit, but writing the information down helps me to let the words sink in. Some issues would definitely need deeper digging and I may not agree with absolutely everything what’s said but up to now, the course has an inspiring informative value. Also, there is a voluntary practical part you may or may not participate in which I opted out for the lack of time at the moment. I have the assignments recorded and want to fulfil them later, even if changed a bit for my purposes. To sum it up, I like the course and feel satisfied to have enrolled on it. It makes me feel motivated and thrilled and willing to learn, practise and experiment. For example, I’m somehow not eager to experiment with perspective and this brings a great impulse to give it a try. It might be a tough but enriching experience. More space allocated to creativity and less to the fear of doing something personally unknown. I’ve become willing to make mistakes – which feels painful to state – and learn from them. The day of perfection may never come but the path itself might be the destination. This is a flower I got for my birthday two weeks ago and when it started to fade, I liked the green that appeared inside. Eventually I captured a different image than I planned, experimenting more than I intended, but this is what was speaking to me. Also the Be still 52 course I subscribed to has started and I like the message of its first week. Learn to become quiet and connect that quiet with taking your photographs. Many times I feel tensed, especially because of all the thing I need or want to do and they are quite a few. More than I’ll ever be able to manage. I myself often impose the stress on myself and there is no room for the quiet. Here I open the door and invite the quiet to help me broaden my mind and listen to my inner voice. I decided to follow the advice given in the first week and started a notebook in my laptop where I want to jot down thoughts and links relating to the course to keep them gathered and easily accessible. My memory is too weak a tool. 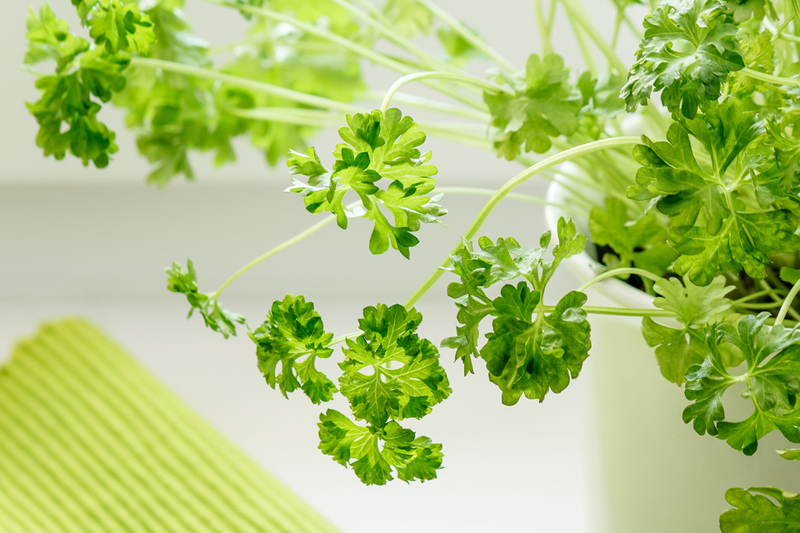 Fresh herbs are great for cooking and serving meals and parsley leaves belong to my favourites so I often have them at home grown in a flowerpot. I need to create a better place for composing my images but there was a beautiful soft light at the window-sill where the pot sits and I used it for this capture. Very nice. Simple and quiet. What a cool shot. I love the photograph of your flower. Lilith, thank you. I’m pleased to know you like the photograph of the flower! I really like the two shots you show. I've been taking a few photo classes on line. I've learned quite a bit but long for an in person class where I could ask questions on the things I find most challenging, like indoor lighting and big lighting contrasts (bright sky with subject thrown in shadows). Sometime I get it, sometimes not and unsure why. Maery, thank you, I’m pleased you like the shots. I understand what you mean and I’m sure there are on-line courses enabling this direct communication. The thing is to find someone good and skilled not to waste one’s money… It would be ideal to have a personal trainer and even that is possible but the amount of money would be quite significant here, I’m sure. The Art of photography course is impersonal, based on videos but the Be still 52 course includes a forum and I expect that every question relevant to the week’s topic may be asked and will be answered based on Kim’s or other participant’s experience which might be extremely useful. I’ve noticed there are many fine photographers among the participants. I’m looking forward to that process. As far as I know, if there is too big lighting contrast, you can use a graduated filter to darken the brightness in the sky, you can come at another part of the day when the contrast is not so significant, you can shoot in raw which enables you to keep more data and save a lot of the capture in post processing. Sometimes nothing may help and you need to expose either for highlights or shadows. And of course it depends also on your camera sensor how great contrast it is able to process. I'm impressed by you energy! However, it seems well worth it judging from the results. 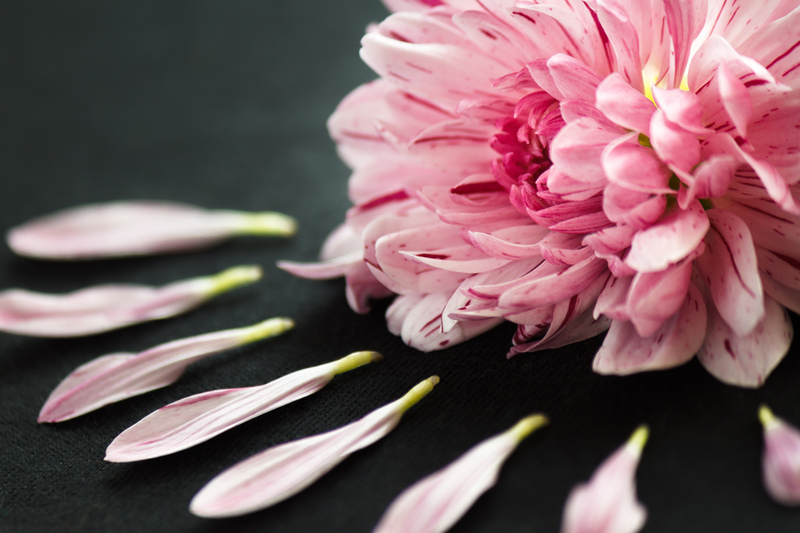 My choice is the first – very elegant with the spread out petals and the use of selective focus. The herbs were a bit "washed-out" for me, but that may be a matter of taste since I know many like that approach. Rune, thank you, I’m pleased you like the flower. I wasn’t sure whether to scatter the petals randomly or arrange them somehow and eventually I preferred this orderly version which felt good to me. As for the other photo, I like its simplicity and colours but understand what you mean. I thought about textures, whether using a texture would enhance the image and I think it could but that’s another step to take which I’m looking forward to learn. It’s been a hectic start of the year but frankly, I love it! Instead of feeling stressed I feel a flow of invigorating energy and that’s marvellous. Amazing. Your nature shots are so unique. Full of detail and life. Lilith, thank you. You’re very kind. I love the idea of this and how I also put stress on myself…perfect advice to stay in the quiet for a while and listen to what our hearts and souls are trying to tell us…beautiful photo too. Donna, thank you. I’m learning to breathe properly and it helps… How is it possible that most of us haven’t mastered this indispensable process thoroughly and don’t breathe effectively enough?? Never late to start improving that. My goodness, I don't know where you get your energy and drive. It must be in the breathing. 🙂 Both of these images are lovely, but the birthday flower is really special. I love it. As for the energy and drive, I don’t know where it comes from, something just pushes me forward all the time! 🙂 I wish I was able to accomplish more and get better in so many regards!